Plain hairstyles get boring as time progresses, isn’t it? Worry not; you are at the right place. Here, you will be privileged to check out highly ranked short curly hairstyles and maybe try out a couple of hairstyles. Short curly hairstyles are recommended for women who desire a simple yet classy look. It also suits women looking for an easy to maintain hairstyle. Below are tips on how to efficiently maintain your curls. Nourish your hair with shampoo- This is vital as your curled hair tends to be dry most times as essential oils struggle to reach your strands. This is because of the curls. As we all know, shampoo contains important nutrients for proper hair growth. Be gently when washing and dry your hair- This is where most people go wrong. Be gentle when washing your hair or dry off water from your head. Minimize brushing your hair or you risk spoiling the curls on your head. Go through the below list before choosing a short curly hairstyle for your hair. Afro curls hairstyle deserves a spot on this list. This hairstyle is attributed by both black and blonde color on your head. However, black color should be dominant throughout the head. Afterwards, form a layered look throughout the head before designing curls on the layered hair. Go on and comb your curls upwards to form an Afro look. The layered look no only enhances the looks on your head, but also makes it easy to form curls on your head. Afro curls hairstyle suits only causal events. You are encouraged to adopt this hairstyle as it gives your hair enough breathing space. Additionally, both black and blonde colors blend with any outfit your wear. As the name states, natural curly hairstyle focuses on giving you a natural look throughout the head. This glamorous hairstyle is characterized by a blonde look throughout the head. Apply blow dry throughout the head to enhance the looks and texture of your hair. Proceed and form a layered look throughout the head before designing curls. Natural curls hairstyle doesn’t limit you on the size of curls to form on your head. It all depends on your taste and desired final look. Move on and rest your front view hair straight either towards the right or left side of the head. It all depends on its position on the head. Finally, comb hair on the back straight. Start off by adopting both a redhead and layered look throughout the head. Move on and draw a line at some point on your mid head. This line determines if your hair will rest on the right or left side of the head. Go on and form a curly-wavy look on both sides of the head before combing your hair straight towards its respective direction. Beach lob haircut emphasizes that your hair remains within your chin. The layered look makes it easy to differentiate beach lob haircut from other similar hairstyles. This casual hairstyle is recommended for women who desire a temporary casual hairstyle. Make an effort of trying out this amazing hairstyle, if your hair reaches the required length. Give your black hair a blonde look throughout the head. However, a section of black hair should be visible on your head. Comb your right sideways hair straight behind your right hair. Sleek the rest of your front view hair straight towards the left side of the head. Go on and form both a layered and curly-wavy look on your sideways hair. Phoenix bob hairstyle gives you a lot of designing freedom. 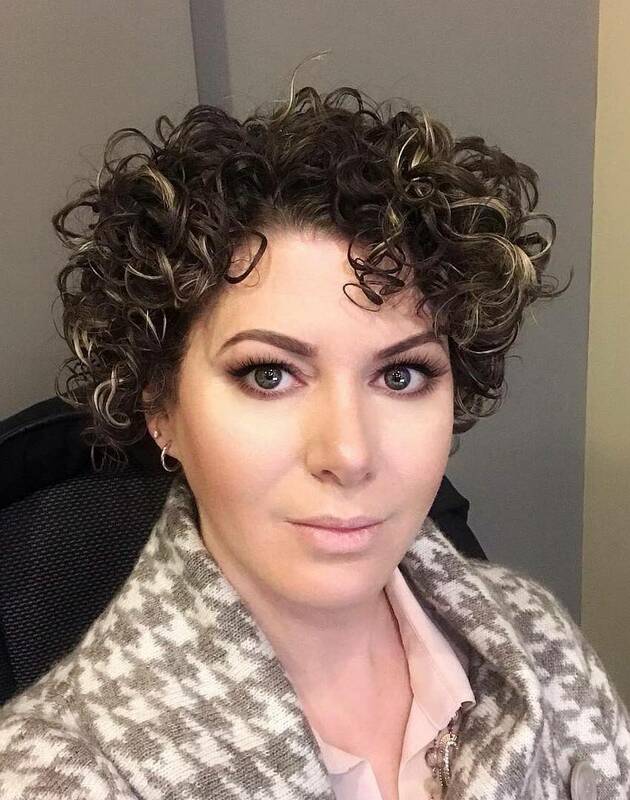 First, you are free to choose the size of curls to form on your head. Secondly, there are numerous ways you can rest your hair. Phoenix bob hairstyle gives you the opportunity to showcase your pretty face and hair. Here, attention lies on both the right and left side of the head. Enhance the looks of this hairstyle through blow dry and forming a layered look. Decide which section of your front view hair rests on the right and which one should be combed straight towards the left side of the head. All your hair should be black apart from your front view edges. Apply highlight color on the edges of your front view hair on both sides of the head. Move on and form a curly-wavy look on both sides of the head. You are free to form a curly-wavy look on the back of the head. You will definitely stand out from your peers if you adopt this marvelous hairstyle. Stretched out blonde hairstyle is attributed by a blonde look throughout the head. Move on and separate your left sideways hair from the rest of your front view hair. Comb the rest of your front view hair towards the right side of the head. That is your right sideways hair, fringe hair and your mid head hair. This is the point you form a curly-wavy look on both the right and left side of the head. Hair on the left side of the head should rest behind your left ear. Hair on the back of the head should also attain a curly-wavy look. Stretched out blonde hairstyle gives you hair enough breathing space. You should have course hair to look good on African American curly hairstyle. Feel free to give your entire hair either a blonde or black look. Comb all your hair upwards before forming curls throughout the head. This is one of the few hairstyles on this list that can be customized to suit any event that comes your way. Women love this hairstyle as it gives them an easy time maintaining it. You don’t have to regularly wash or maintain your curls. Furthermore, African-American curls hairstyle perfectly blends with any outfit you wear. Women looking for both temporary and permanent hairstyles are perfect candidates for this hairstyle. As the name suggests, perfect curly bob hairstyle focuses on giving you a curly look throughout the head. Perfect curls bob hairstyle is attributed by both a black and layered look. Carry on and adopt a layered look throughout the head. Afterwards, rest your fringe hair straight on your forehead. Conjoin your mid head hair with hair on both sides of the head. Hair on the back of the head should also attain a curly-wavy look before being combed straight towards its natural growing direction. The black color makes perfect curly bob hairstyle match with any outfit you choose. That’s not all; you are not limited on the size of curly-wavy look to adopt on your head. Do you desire a colored look on your head? If yes, try out colorful curly hairstyle. This marvelous hairstyle is characterized by a blend of purple and blonde look on your head. 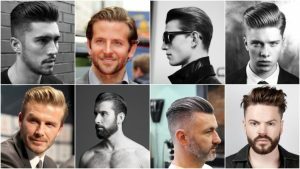 Proceed and form a layered look throughout the head. The layered look on your head makes it easy to form curls on your head. Consequently, it also enhances the looks of your entire look. Form a curly-wavy throughout the head. Move on and rest your fringe hair on your forehead. It should conjoin with hair on both sides of the head. Similarly, your mid head hair should conjoin with hair on both sides of the head. Lastly, your hair should rest above the neck region. Driftwood haircut is one of the latest hairstyles on this list. It is characterized by a blend of blonde and black look throughout the head. The blonde look should be dominant throughout the head. Go ahead and form a layered look throughout the head before forming small curls on the head. Driftwood haircut suits women looking for both a temporary and permanent hairstyle. Additionally, driftwood haircut gives your hair enough air needed for proper growth. That’s not all; this is one of the easy to maintain hairstyles on this list. A large fraction of your front view hair should lie on both sides of the head. Lastly, you will have an easy time changing this hairstyle. This marvelous short curls hairstyle is attributed by both a black and layered look throughout the head. Enhance the looks of your entire hair through blow dry. Comb hair on the back of your head, right sideways hair and your left sideways hair straight towards its natural growing direction. Afterwards, conjoin your fringe and mid head hair with hair on both sides of the head. Move on and form a curly-wavy look on both the right and left side of the head. Voluminous curly bob haircut allows you to form a curly-wavy look on the back of the head if you deem necessary. Additionally, your sideways hair should systematically reduce in length as it stretches towards the back. Do you desire to showcase your fringe hair? If yes, this is what you need. Give your entire hair a black and layered look before commencing the designing process. 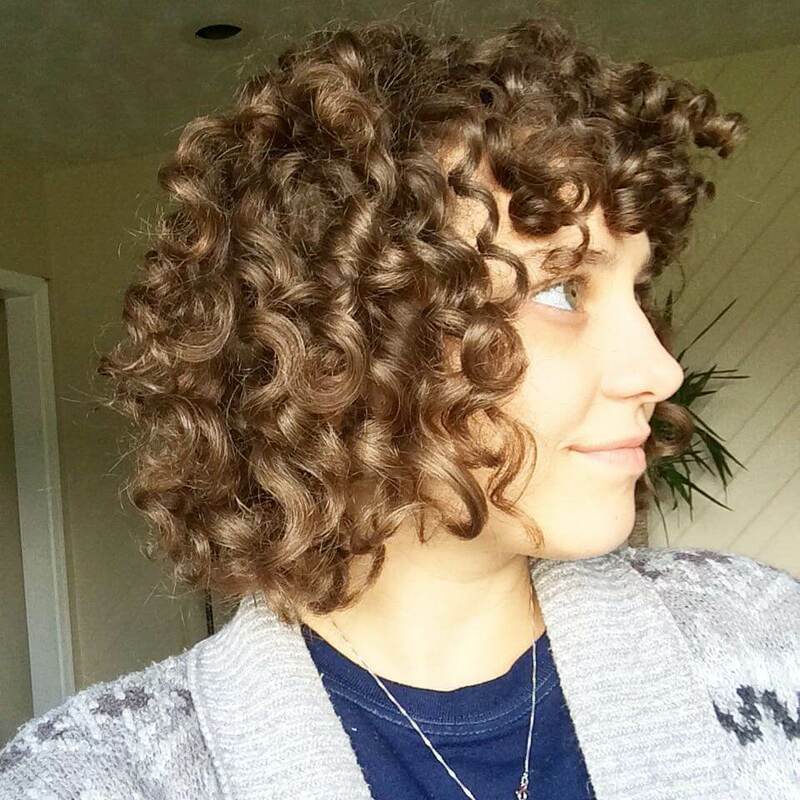 Carry on and form a curly look throughout the head. Fringe and bangs haircut doesn’t restrict you on the size of curls to form on your head. It all depends on your preference and the general look you wish to attain from this hairstyle. Go on and conjoin your mid head hair with hair on both sides of the head before combing it straight towards its respective direction. Traces of blonde color should be visible at some point on your black hair. This glamorous short curls hairstyle suits women with thin hair. It is characterized by both a black and layered look throughout the head. Go on and comb your right sideways hair, left sideways hair and hair on the back of the head straight towards its natural growing direction. Sleek a large fraction of your fringe and mid head hair on the left side of the head. Move on and form a curvy look on both sides of the head. Trim your hair so that it rests above the neck region. Women who adopt this hairstyle can easily customize this casual hairstyle to suit official functions. You will also have an easy time maintaining this hairstyle. Choose an experienced stylist if you desire to look good on this amazing hairstyle. Start off by giving your hair a blend of black and brown color on your head. Carry on and form both a layered and curly-wavy look throughout the head. The lob hairstyle doesn’t limit you on the curls to adopt on your head. A large fraction of your front view hair should rest on both the right and left side of the head. Comb the rest of your hair straight towards the back of the head. This is the reason the lob hairstyle is considered one of the simplest and easy to maintain hairstyles. The lob hairstyle definitely deserves to be on this list. Vintage big curls haircut has been in existence for a long period. Proceed and form both a black and curly look throughout the head. Adopt a layered look on your head to simply the process of forming curls on your head. Go on and rest your fringe hair on your forehead and should conjoin with hair on both the right and left side of the head. Similarly, your mid head hair should conjoin with your sideways hair. Vintage big curls haircut is a causal hairstyle. This is because of the layered and curly look. Comb hair on the back of the head straight towards its natural growing direction. Look no further if you desire curls throughout the head. Simply check out tousled curly bob hairstyle. You can either use black or highlight color on your head when designing this hairstyle. Consequently, a large fraction of your hair should attain both a layered and curly look. Comb your right and left sideways hair straight towards their respective direction before conjoining it with your mid head hair. Rest your fringe hair on your forehead and should conjoin with both the right and left side of the head. Tousled curly bob hairstyle gives you the opportunity to showcase your long hair. Above all, this amazing hairstyle doesn’t limit you on the size of curls to form on your head. Here, attention lies on both sides of the head. Most of your front view hair should rest on the left side of the head. That is your fringe hair, mid head hair and your left sideways hair. Up-turned bob haircut emphasizes that your hair attains both a blonde and black look throughout the head. Consequently, your entire hair should attain a layered look. 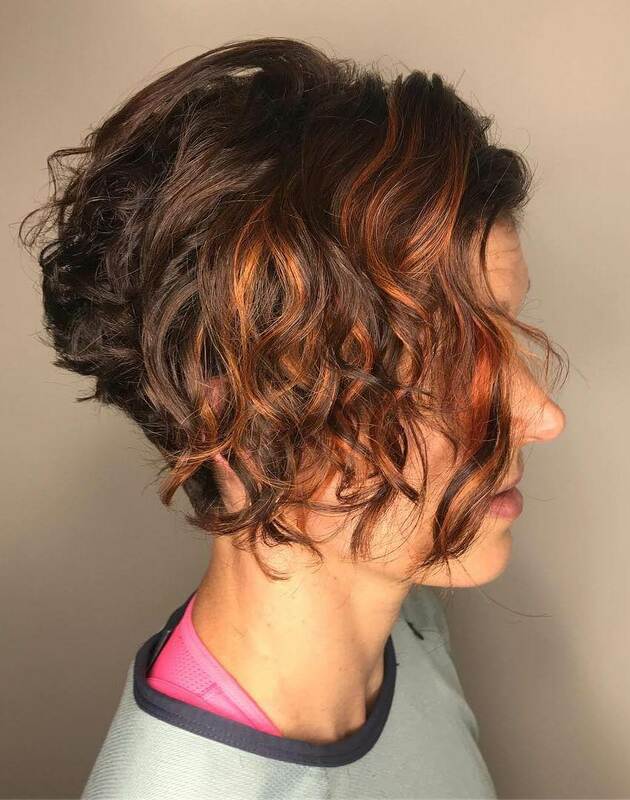 The layered look makes it simple to form a curly-wavy look throughout the head. Comb hair on the back of the head straight towards its natural growing direction. Similarly, hair on the right side of the head should rest straight towards its natural growing direction. Do you desire a messy look throughout the head? If yes, glance on this marvelous short curls hairstyle. Dark chocolate messy hairstyle Suits anyone who desires a color blend hairstyle. Here, you are encouraged to adopt both black and brown color. Adopt both a layered and curvy look throughout the head. This is the easiest and simplest way of attaining a messy look throughout the head. Comb your front view hair straight either towards the right or left side of the head, depending on its position on the head. The layered and curly look should be visible on both sides of the head to attain a messy look. Finally, hair on the back of the head should form a rounded look. Black ale curly hairstyle gives you a lot of freedom when it comes to choosing hairstyles that deciding the size of curls to form on your hair. A section of blonde colors should be visible on your head. Above all, black ale curvy hairstyle emphasizes that your hair remains above your hairline. Form a layered look throughout the head to make it easy to form curls throughout the head. Unevenly comb your curls throughout the head to attain a shag look. Finally, black ale curly hairstyle suits only social functions. As the name suggests, this glamorous hairstyle focuses on giving you short curls throughout the head. A large fraction of your front view hair should lie on the left side of the head. You are free to enhance the looks of your curls by applying gel. Short curls glam haircut favors women who desire for a temporary hairstyle. The layered and curly look throughout the head makes it easy to maintain your hair. In fact, you don’t have to regularly visit your stylist for maintenance. Lastly, short curls glam haircut ensures your hair attains enough breathing space.